He is the Shaykh, the Allāmah, the Muhaddith, Rabī’ ibn Hādī ibn ‘Umayr al-Madkhalī (may Allah preserve him) – from the well-known tribe “Al-Madākhilah” in the region of Jīzān in the South of Saudi Arabia. He was born in Jirādiyah, a small village 3km west of the city of Sāmitah, which has now merged with the city. His birth took place in the end of 1351AH, and his father passed away close to one-and-a-half years after his birth, so he grew up and developed in the house of his mother (may Allah have mercy upon her). So she overlooked his upbringing and she carried out his tarbiyah (cultivation) in the best manner, and she taught him praiseworthy manners such as truthfulness and trustworthiness, she encouraged him with the prayer, enjoining it upon him, with the supervision of his uncle. When the Shaykh reached 8 years of age, he joined the circles of knowledge in the village. He learned writing and reading, and from those who taught him writing was Shaykh Shaibān Al-‘Arīshi, and also the Judge, Ahmad Ibn Muhammad Jābir Al-Madkhalī, and also he learned to write at the hands of a third person by the name of Muhammad Ibn Husain Makkī from the city of Sibyā’. He also read the Qur’an upon Ash-Shaykh Muhammad Ibn Muhammad Jābir Al-Madkhalī, just as he recited upon him Tawhīd and Tajwīd, and he also read at the Salafī School of Sāmitah City after that. The Shaykh, the ‘Ālim, and the Faqīh: Nāsir Khalūfah Tayyāsh Mubārakī (rahimahullāh) – the famous scholar from the senior students of Ash-Shaykh Al-Qar’āwi – and he (Shaykh Rabī’) studied with him the books: Al-Bulūgh Al-Marām and Nuzhatun-Nadhr of Al-Hāfidh Ibn Hajr. Then after that he joined The Academy of Knowledge in Sāmitah, and there he studied with a number of noble scholars, and from the most well-known of them was without a doubt, Ash-Shaykh Hāfidh Ibn Ahmad Al-Hakamī – the famous scholar (rahimahullāh) – and he likewise studied with his brother; the virtuous Shaykh, Muhammad Ibn Ahmad Al-Hakamī. He also studied at the hands of the Shaykh, the ‘Allāmah, the Muhaddith, Ahmad Ibn Yahya An-Najmi (rahimahullāh), and he also studied ‘Aqīdah at the school with the Shaykh, the ‘Allāmah, Dr Muhammad Amān Ibn Alī Al-Jāmi (rahimahullāh). Likewise, he studied Fiqh with the Shaykh, the Faqīh, Muhammad Saghīr Khamīsī (studying the book Zād Al-Mustaqni’), and other than these there are many others with whom the Shaykh studied Arabic, etiquette, eloquence, and poetry and prose. And, towards the end of 1380AH, with some determination, he graduated from the Academy of Knowledge of Sāmitah City. And in the beginning of 1381AH, he joined the Faculty of Sharī’ah in Riyādh and stayed there for a month or two – but then opened the Islamic University of Al-Madīnah An-Nabawiyyah, so he moved to Madīnah and joined the Faculty of Sharī’ah at the Islamic University, and he studied there for four years before graduating in the year 1384AH with the grade: Mumtāz (Excellent). The Eminent Shaykh, Al-‘Allāmah, The Grand Mufti of the Kingdom of Saudi Arabia: ‘Abdul-‘Azīz Ibn ‘Abdullāh Ibn Bāz (rahimahullāh) and from that which he studied with him was Al-‘Aqīdah At-Tahāwiyyah. The Virtuous Shaykh, the ‘Allāmah, the Muhaddith, Muhammad Nāsirud-Dīn Al-Albānī (rahimahullāh) and he studied Hadīth and chains of transmission with him. The virtuous Shaykh, the ‘Allāmah, ‘Abdul-Muhsin Al-‘Abbād, and he studied with him Fiqh for three years at the beginning of his studies. The virtuous Shaykh, the ‘Allāmah, the Hāfidh, the Mufassir, the Muhaddith, the Scholar of Usūl, the grammarian, the linguist, the Faqīh, the genius, Muhammad Al-Amīn Ash-Shanqīti – famous for his book Al-Adhwa’ Al-Bayan – and he studied with him Tafsīr, and the Foundations of Fiqh, for the period of 4 years. Shaykh Sālih Al-‘Irāqī with whom the Shaykh studied ‘Aqīdah. The Shaykh, the Muhaddith, ‘Abdul-Ghaffār Hasan Al-Hindī with whom the Shaykh studied the Sciences of Hadīth and Terminologies (i.e. Mustalah). And after his graduation he worked as a teacher in the Ma’had of the Islamic University for a period, then he embarked after that upon Higher Education and continued his studies before attaining his “Masters Certificate” in the area of Hadith at the Makkah branch of the King ‘Abdul-Azīz University in 1397AH with his famous thesis: “Between the Two Imāms: Muslim and Ad-Daruqutni.” In 1400AH he completed his PhD Doctorate at the same university, attaining the grade “Mumtāz (Excellent)”, with his checking of “An-Nukat ‘Ala Kitab Ibn Salah” – the book of Al-Hāfidh Ibn Hajr (rahimahullāh). Thereafter he returned to the University of Madīnah to teach in the Faculty of Noble Hadith, where he taught Hadith and its various Sciences, and he likewise presided over the (Higher Education) Department of Sunnah many times. He then attained the rank of “Professor” – may Allah preserve him upon health and safety and good actions. The Shaykh (may Allah preserve him) excels in abundant humility with his brothers, students, those who travel to visit him, and his visitors. Likewise, he is humble as regards his home, his clothes, and his vehicle – he does not like luxury in any of that. He also is constant in advice, he is good-natured, and the one who sits with him does not become bored whilst conversing with him. His sittings are taken up with the reading of Hadīth and Sunnah, and with an abundant warning from innovations and their people, such that the one who sees him and does not know him or associate with him, imagines that nothing occupies him except this. He loves the Salafi students of knowledge, and he honours them and treats them with goodness, and he tries to fulfil their needs to the best ability of himself and his wealth, and his house is always open to the students of knowledge such that there is not a day when he eats his breakfast, his lunch, or his dinner alone – and he looks after his students and cares for them. He is from the callers who are zealous over the Book and the Sunnah and the Creed of the Salaf, and he is filled with protective jealousy and intense concern over the Sunnah and the Salafī ‘Aqīdah. Few are seen like him in this time and he is from the defenders in this time of ours of the Manhaj of the Pious Predecessors – in the night and in the day, in secret and in public – for Allah’s sake – regardless of that which comes to him from the blame of the blamers. “Bainal-Imāmain Muslim Wad-Daruqutnī” – “Between the Two Imams: Muslim and Ad-Dar Qutni.” And this was one large volume which was the thesis of his Magistrates degree. “An-Nukat ‘Ala Kitāb Ibn Salāh” – “Points Upon the Book of Ibn Salāh.” Published in 2 volumes and it was his PhD thesis. “Jamā’ah Wāhidah Lā Jamā’āt; Wa Sīrat Wāhid Lā ‘Asharāt” – “One Jamā’ah – Not Many Jamā’ahs; and One Path – Not Tens of Paths,” which was part of a critical dialogue with ‘Abdur-Rahmān ‘Abdul-Khāliq. 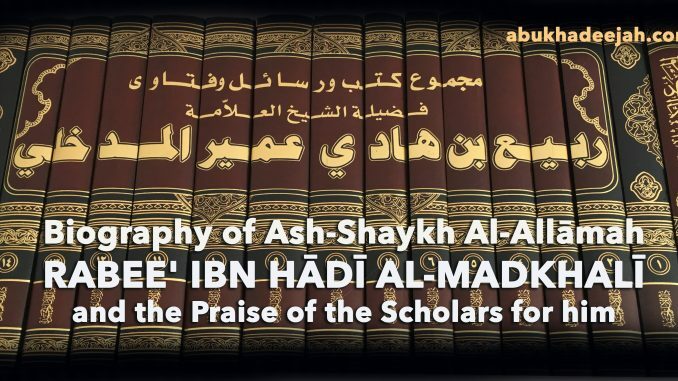 And the Shaykh has many other books other than the ones we have mentioned here, and our brother Khālid Ibn Dhahwī Adh-Dhafīrī has gathered their names and a brief synopsis of each of them in his book “Thabt Mu’allafāt Ash-Shaykh Rabī’ Ibn Hādī Al-Madkhalī”, and you can find this on the website of Shaykh Rabī’. And we ask Allāh, the Most High, to preserve him to complete this goodly mission, and that he gives him success to attain that which Allāh loves and is pleased with, for indeed Allāh is the Guardian of that, and is All-Able over it. “Shaikh Rabī’ is a standard-bearer, strong, elevated – a flag-bearer of the Sunnah. The great scholars and Imāms have born witness for him, commended him and praised him. So it is not befitting that the likes of me are asked concerning him, may Allāh preserve him. However since now I have been asked, then I am compelled to answer. See An-Naqulāt as-Salafiyyah fir-Radd ‘alat-Tā’ifatil-Haddādiyyah, (51). See Majmū’ Kutb wa Rasā’il wa Fatāwā Shaikh Rabī’ bin Hādī al-Madkhalī, vol. 1, p. 501. “Indeed, this knowledge is Religion, so look [and investigate] from whom you are taking your Religion.” (no. 26). “They used not to ask concerning the chain of narration, but when the tribulations struck, they would ask: Name us your men! So they would look towards ahlus-Sunnah and take their reports – and they would look towards ahlul-Bid‘ah and not take their reports.” (No. 27). So the science of al-Jarh and at-Ta’dīl stretches back to the time of Prophethood and it is established in the Religion as a means of preservation and protection from the imprecise, the liars, the untrustworthy, the forgers and the innovators. May Allāh reward the Imāms of this noble science. This audio recording of this statement and the previous one with English translation can be found at www.themadkhalis.com. See Fadā’ih wa Nasā’ih of Shaikh Muqbil, (p. 126). Cassette: al-As’ilah as-Sunniyyah li ‘Allāmah ad-Diyār al-Yamaniyyah – questions from the young men of Tā’if. Narrated by Abul-Hasan ar-Ramlī from Shaikh Muqbil in his second article in refutation of ‘Alī al-Halabī. See Siyānatus-Salafī min Waswasati wa Talbisāt ‘Alī al-Halabī of Shaikh (p.327).